Over twenty years have passed since the original release of Steven Spielberg’s Jurassic Park, but audiences still flock in droves to a theater to catch dinosaur mayhem. Despite the 1993 first entry in the franchise, the most recent installment is the first Jurassic Park sequel to capture the wonder and awe of the first. Jurassic World comes out as the third sequel to the action/ adventure masterpiece, but nearly all of the familiar faces from the past films have moved on to jobs with fewer dinosaur accidents. A completely new cast of characters work at the new, improved dinosaur attraction and resort. Many years after the incident of the first Jurassic Park nightmare, another dinosaur-populated park has flourished as the most popular tourist/ vacation destination on Earth with no public disturbances on record. However, when genetic engineers create a new hybrid dinosaur to both terrify and attract crowds, it seems as if science was all-too-able to oblige. Jurassic World is a film that finally takes billionaire tycoon character John Hammond’s concept of an open park from the first film and builds upon it. Bryce Dallas Howard (The Help, Terminator Salvation) plays the protagonist, Claire. Claire has a lot to handle at film’s start, so much in fact, that she can’t even devote a shred of a time to spend with her nephews. She runs the day-to-day operations of “Jurassic World”—an island paradise resort where guests come to see the living, “extinct” beasts of the ancient world. When we first catch up with Claire, she’s juggling an investor/ tour presentation, communicating with ownership on the park status, and trying to arrange some time with her newly-arrived nephews. While an awful aunt at the beginning, Claire quickly learns perspective over the course of another unexpected dinosaur disaster on the island. Howard’s performance has the most dynamic, as she learns more about life and herself as she risks life and limb trying to rescue her nephews who have gone rogue in the jungle during the initial mayhem. Chris Pratt (Guardians of the Galaxy, “Parks and Recreation”) also stars in a supporting role, proving once again that surrounding oneself with CGI doesn’t have to affect one’s performance. Pratt plays Owen, a jovial, ex-military sort who trains the velociraptor pack on the island. Owen’s uncanny ability to bond with and lead the unit of dinosaurs stirs up a violent idea for a greedy company man on the island—weaponize the velociraptors and deploy them as needed. Although Owen staunchly opposes this plan, he doesn’t have much time to react to this decision because Claire enlists his services in saving her nephews from the park. Owen and Claire have history, but it doesn’t sound pleasant. Throwing these two together had a legitimate Romancing the Stone vibe as the wise-cracking, roguish sort leads the professional, business-oriented stiff through the wilderness. Many expected the Jurassic Park franchise to close with the 2001 sequel, Jurassic Park III, because of low critical reviews and higher box office expectations. However, director Colin Trevorrow (Safety Not Guaranteed) shows that a soft reboot can eliminate any sort of contrivance cooked up by troublesome sequels that lacked narrative. Instead of another movie where one of the original cast members falls into bad luck with Cretaceous creatures, Trevorrow presents all new flawed heroes and advances the story. The director wants to know how such a theme park would sustain itself and keep relevant in a world where everybody wants “bigger, scarier, …cooler.” Simply put, Jurassic World isn’t just a T-Rex chasing Jeff Goldblum or Sam Neill for two hours because it’s been a few years since the last time it happened. Trevorrow looks at ethics surrounding the park. What if these genetic engineers pandered to public desire and gave the people what they wanted—scarier dinosaurs. Do extinct animals have rights? The answer varies from character to character. 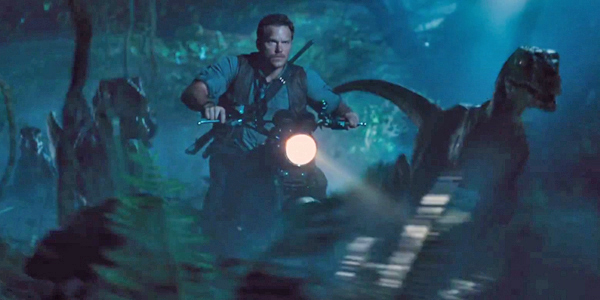 After 22 years, Jurassic Park finally found its most-worthy sequel in the 2015 installment. Bryce Dallas Howard and Chris Pratt give stand-out performances, leading a new cast of characters in the titular reopened park. Director Trevorrow expands upon Safety Not Guaranteed and continues to create quality science-fiction narrative in spite of studio pressure, a big budget, and following the steps of master auteur Steven Spielberg. Unlike extended, bloated blockbusters of recent memory, the film wraps things up on a steady pace to leave the audience wanting more. Hopefully, Star Wars continues this trend around Christmas. Jurassic World takes the timeless feel of Jurassic Park and builds upon the original concept for a new generation of filmgoers.